healthy. But the shareholders of housing corporations include homeowners, making these de facto indirect loans to households, and households might thereby be tempted to take on more debt than can easily be repaid. institutions easing lending standards and a rapid increase in non-bank lending. The expansion has been associated with an increase in payment defaults. Household debt has been increasing steadily, despite the increase in real disposable incomes. Saving rates are lower than peers, although some of the difference is attributable to Finland’s public pension system. 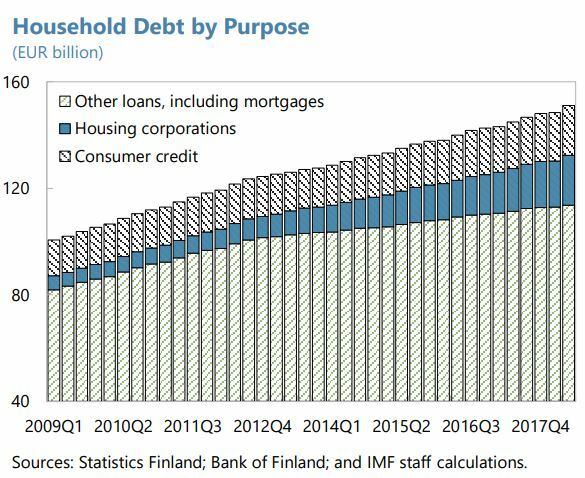 Household debt remains lower than Nordic peers, but is expected to increase further. 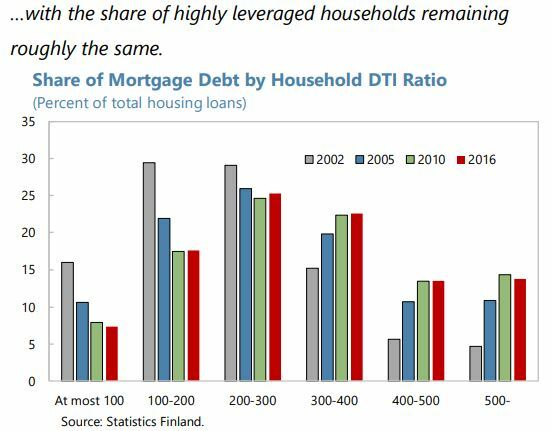 Highly-indebted households (i.e. those with debt greater than four times their income) accounted for over a quarter of borrowing in 2016; preliminary survey data for 2017 indicate that the typical new borrower for housing purchases is taking on leverage of 4½ times income. The share of floating rate loans in household lending is high, exacerbating households’ vulnerabilities to interest rate and/or income shocks, although this is mitigated by the prevalence of mortgages with annuity repayments. Residential real estate markets do not seem overheated overall, but demand still exceeds supply in major metropolitan areas, and commercial real estate may expose the economy to shocks. 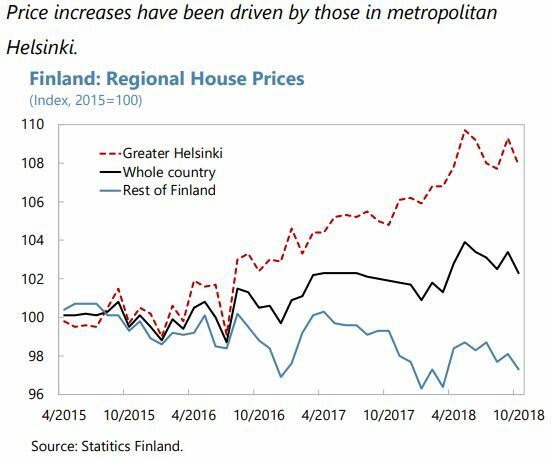 Housing starts and completions have been elevated, but price increases in greater Helsinki suggest demand still outstrips supply. 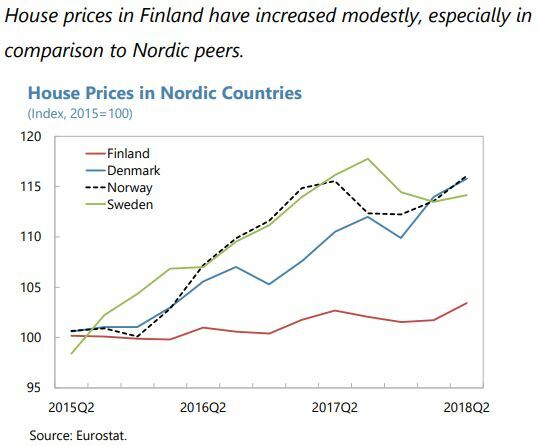 Across the whole country, house price increases have been modest, especially in comparison to Nordic peers, with house price deflation in regions outside greater Helsinki. Price-to-income and price-to-rent ratios have not risen much during the recent economic recovery. Low and declining yields in commercial real estate suggest relatively high valuations. The authorities have tightened credit policies. A floor of 15 percent on the average risk weight for housing loans took effect in January for institutions using internal risk-based (IRB) models. Effective July, the maximum loan-to-collateral (LTC) ratio for housing loans (excluding loans on first homes) was cut from 90 to 85 percent. The recent tightening is appropriate, but policy could be more effective if the toolkit were modified. 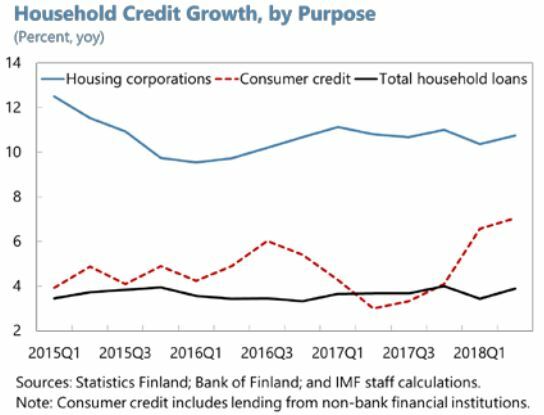 Although overall household debt and leverage are not high in comparison with other Nordic countries, there are some cohorts that are increasingly vulnerable to income and/or interest rate shocks—which, in view of the concentration of total lending in real estate, opens the financial system to risks. 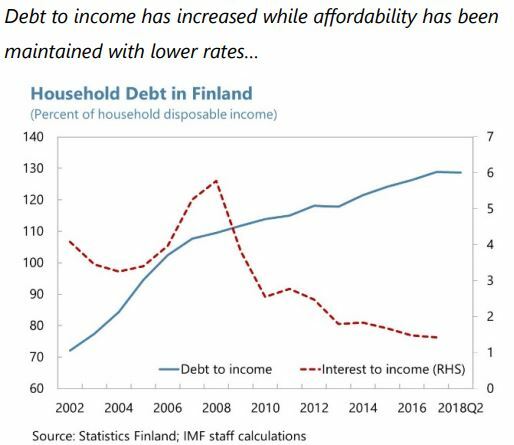 underlying problem is more the level of debt than housing valuations, it would be useful for the authorities to have debt-based macroprudential tools (such as debt-to-income or debt-service to-income caps) at their disposal should leverage become more stretched. Applying such tools well depends on accurate information. Staff supports the recent Justice Ministry recommendation for the establishment of a “positive credit register”—i.e. a database that credit firms and the FINFSA could use to obtain real-time information about customers’ debt and income levels. A new challenge arises from non-bank lending, including online platforms such as peer-to-peer lending, which is not being recorded in credit statistics and registers. 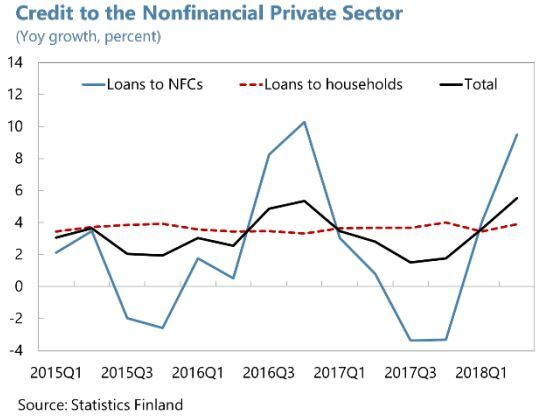 The growing reliance on consumer credit, especially that provided by non-banks and via digital platforms, raises additional concerns. Some of these outlets are not regulated and provide cross border financing. Attempts were made to circumvent legally-binding interest rate caps, raising the question of whether borrowers—especially those dealing with non-bank lenders—are sufficiently informed about the conditions of their loans. The authorities are amending the legislation on interest rate caps to close loopholes. Additional consumer protection measures are needed and require more data collection, especially on consumer lending provided through digital platforms. Tighter prudential requirements to demonstrate creditworthiness could also be considered.